The ultimate pro blog planner workbook every SMART blogger needs to take their blog to the next level! Your time is extremely valuable, and there's nothing more frustrating than wasting it by trying to frantically organise and plan your blogging business. From scheduling your blog writing, to setting time aside for doing marketing and promotion. From writing and sending email newsletters, to writing guest content. From doing blog commenting, to keeping up with your social media activities, and everything else in between, as a blogger you are responsible for a lot of things. What's included in the Ultimate Pro Blog Planner Workbook? 30 A4-Size Printable PDF Templates! Blog Information Sheet. 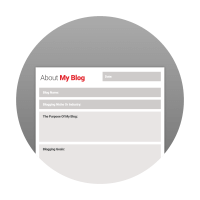 Let's start with the About My Blog Info page. This is where you can add information such as your blog's name and niche. Most importantly, you can add your blog's purpose (goal). You can also add your long-term goals and current statistics about your blog. Perfect for reviewing over to ensure you're staying on track. Affiliate Information Worksheet. Next, we have a useful worksheet for keeping a record of all the affiliate programs you are signed up for. Here you can add a list of the products or services you promote, current commission rate, conversion rate, affiliate manager contact information, etc. Blog Income And Expenses Worksheet. (Monthly) A useful accounting worksheet for keeping tabs on your monthly blog income and expenses. Keeping track of this is important if you want to grow your blog into a profitable online business. Make sure you review your income growth so you can strategize for creating new income streams from your blog. Blog Maintenance Checklist. A nifty little checklist of the most essential things to do to ensure your blog stays in good shape. The checklist includes basic and advanced weekly and monthly blog maintenance tasks, especially useful if you use WordPress as your blogging platform. Blog Post Creation Checklist. With this worksheet, you'll never miss an important criteria when creating your blog posts. From creating a catchy headline title to adding visual content such as images, videos, and infographics. From adding click-to-tweet boxes to native and external links and resources, it's all here. Blog Post Planner. Got a new idea for a great blog post? Plan it all in the post planner worksheet. Create your headline title, add keyword ideas, add your categories and tags. You can also add notes about your research, create a deadline and scheduling date for your post, and more. 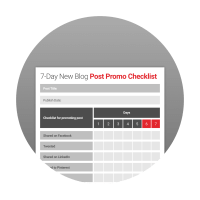 7-Day Blog Post Promotion & Marketing Checklist. Drive all the traffic you want to your latest blog post, plus get more comments and social shares with this useful Blog Post Promotion Checklist. You can also use these worksheets to plan a promotion schedule for your older and valuable content. ​Blog Traffic Growth Goal Tracker. Planning to increase traffic to your blog? 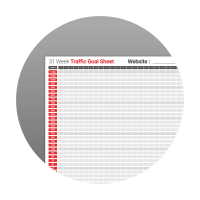 Stay on course with your traffic growth targets with this useful worksheet. Track blog traffic growth for up to 30+ weeks per sheet and from 0 to 1,100 daily visits. 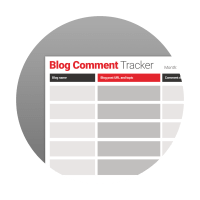 ​Blog Comment Planner. Want to connect with more bloggers and grow your influential audience through blog commenting? Perfect, because Included with the UPBP is a fantastic comment planner worksheet. Record the comment left and response date and time, including the blog URL you left the comment on. ​​Monthly Calendar Templates. Organise your entire blog and marketing content strategy with this useful universal monthly editorial calendar template. Consistency in blogging is key, and this planner will help you keep on top of your content creation and scheduling. Each beautifully crafted template will help you to plan and organise your blog like never before, but most importantly, each template will help you to take action on those plans thus helping you reach your ultimate blogging goals in 2018 and beyond. 30 A4-Size printable PDF templates to choose from. Do more guest blogging and blog commenting. Become memorable on social media. Schedule and organise your entire content marketing. Track your blog income and expenses, and more. 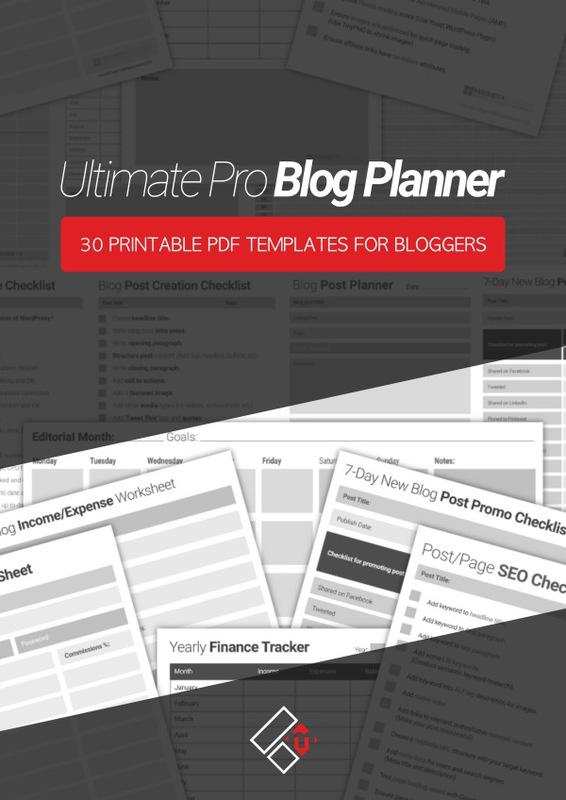 Get Instant Access To The Ultimate Pro Blog Planner Now! Thousands of blogs are created every day. Don't just become another blogger on the block, become the SMART blogger that stands out in the crowd. Take your blog seriously, turn it into a profitable business. Click the button below to make a start. ​Email Newsletter/Marketing Planner/Tracker. 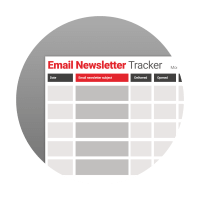 Create and organise your email marketing newsletters with this email marketing planner and conversion tracker. Record vital information such as date sent, delivery rate, open rate, clicks and conversions. ​Blogger/Influencer Email Outreach Planner. Connect with more influencers, find guest bloggers, content marketers, advertisers, and more, with this useful printable influencer email outreach planner template. ​​Expert Roundup Post Planner (New). Want to save a HUGE amount of time and create better expert roundup posts for your blog? 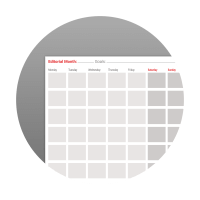 Get planning and stay organised with this minimalist Expert Roundup Planner template. 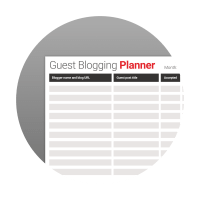 Guest Post Planner. Are you planning to do more guest blogging to increase awareness about your blog and grow your audience in 2018 and beyond? If so, you can strategise your guest blogging content, goals, topics, and more with the best Guest Blogging Planner worksheet in town! Monthly Goal Tracker/Planner. What is the ONE thing you want to achieve with your blog this month? Break it down with incremental goals each day, and each week, until you reach your month goal with this simple, motivation-driven tracker/planner! Monthly Goal Tracker II. Define each goal you want to reach each month, tick the box if you've crushed it, or tick the box if you failed to reach your goal. Then step back to see the trending pattern. Are you crushing more goals and failing less? 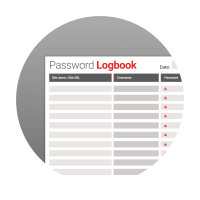 ​Usernames And Passwords Logbook. Tired of having to keep changing your usernames and passwords for your email accounts, WordPress site, hosting site, and various other online services because you keep forgetting them? Not anymore, you can keep track of all your usernames and passwords with this handy printable log sheet. Keep it in a safe place for quick and easy reference. ​SEO Checklist For Blog Post/Page. Never miss a single opportunity to optimize your content for better search engine visibility again! This SEO checklist is up to date and contains everything you need to make sure you've not forgotten even the smallest detail. ​​Post Topic Ideas Planner. When ever you get an idea for a great blog post topic, write it down immediately. Not sure where? That's OK, because included in the Ultimate Pro Blog Planner is a useful worksheet for doing just that. SMART Goal Planner. Now, what ever your goals are for taking your blogging business to the next level this year or the next, plan it properly using the S.M.A.R.T goal planner worksheet. Get Specific about your goals. Make sure they're Measurable. Take Action, be Realistic, and reach your goals in a Timely fashion. You can't fail with this worksheet! Social Media Timesheet. Love promoting your content on social media? Who doesn't? Does social media drive most of your blog's traffic? Well, now you can record the best times to post on Facebook, Twitter, LinkedIn, Pinterest, Instagram, and more. Blog/Email/Social Stats Tracker. Keeping tabs on your blog's traffic growth and stats, email list growth, and social network followers growth is so important. And, I've made it simple for you to do this with this powerful stats worksheet. Weekly Blog Planner Template. A useful 7-day worksheet for planning your week of blogging activities and goals. Plus there's a useful to-do list at the bottom of each woksheet. Yearly Goal Tracker/Planner. Get ready to make some BIG plans for your blog this year or next year. Set your yearly blogging goals and crush them like never before with this useful goal and progress tracker. Yearly Finance Tracker. Keep a record of all the income and expenses for your blogging business for an entire year. Use this with the Blog Income & Expenses Worksheet. Useful for doing your tax calculations for the end of the year too. YouTube Video Planner (New). Are you planning on creating more videos to promote and market your blogging business? Awesome! Included is a useful video planner worksheet. Add your video title idea, description, call-to-action, video running time, video tags, and more. YouTube Subscriber Growth Planner (New). Do you want to grow your YouTube subscribers this year? Make it happen with this subscriber growth tracker. New templates added for 2019!!! Second guessing where you're going to be with your blogging business in the next 6 or 12 months is not exactly strategic planning. The only way you can move forward is by really planning your success and then taking action. 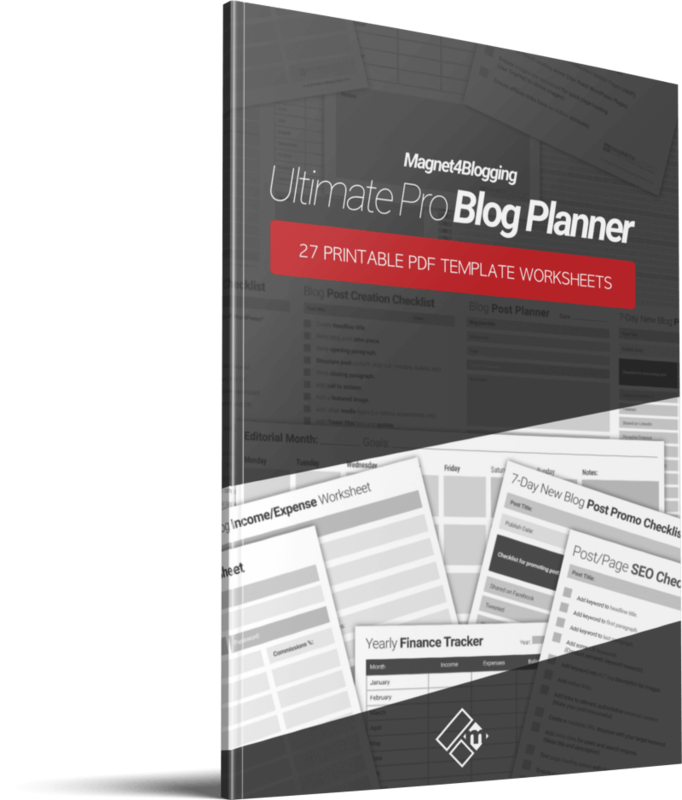 The Ultimate Blog Planner will help so many bloggers do just that. The Best Time to Start Planning Your Blog is Now! What are you waiting for? Don't waste another minute procrastinating. If you're serious about conquering your blogging goals and taking your blogging business to the next ultimate level. 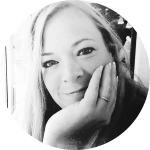 If you're serious about growing your traffic, readership, and generating more income from your blog - then grab a copy of my Ultimate Blog Planner today.